Cambridge, MA—In the heart of the U.S. automotive industry—about 30 miles north of Detroit in Auburn Hills, Michigan—Faurecia, a global automotive supplier, opened its new North American headquarters in mid-July. 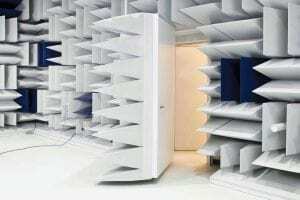 The 278,000 square-foot facility encompasses a high-tech research and design center featuring an anechoic test chamber designed and installed by Eckel Industries of Cambridge, Massachusetts. Chances are consumers don’t give a thought to the noise and vibration emitted by the motor controls of the seats in their cars, unless they’re loud, grating or lurching. But the reality is that automotive manufacturers invest time and money in testing these parameters to ensure consumer comfort and meet industry standards. And that’s where Faurecia and Eckel enter the picture. Faurecia wanted to take its automotive seating noise and vibration testing to the next level to achieve the highest industry standards. And, with a large share of its global sales being to premium automotive manufacturers, subjective “psycho-acoustic” benchmarks are crucial. 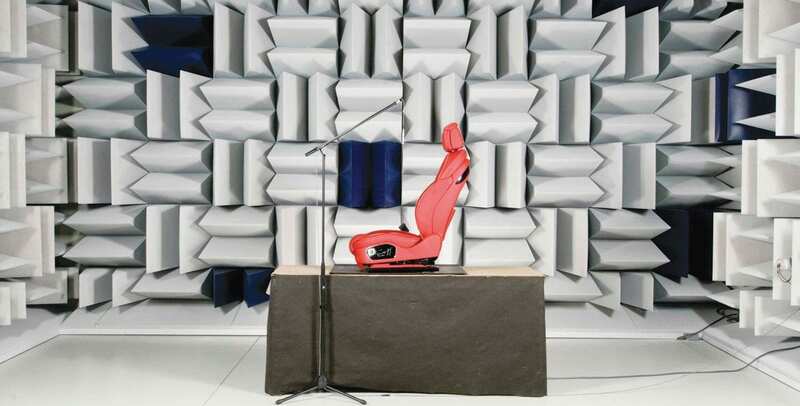 Having worked with Eckel in the past and knowing the company’s ability to meet standards beyond the norm, Faurecia went directly to the Eckel team to design and install a hemi-anechoic test chamber for the Automotive Seating R&D Center in its new headquarters. It is the largest chamber in any of Faurecia’s worldwide locations and can accommodate an entire vehicle. Eckel’s team of designers and engineers worked closely with Faurecia’s building contractor on the requirements for the room within which the chamber would be installed. The team also responded swiftly and deftly to ongoing requests for changes to the chamber layout. The design process began in June 2013. In February 2014, Eckel got the call to head to Michigan to install the chamber, which has been operational since March. Faurecia began conducting testing in April as it transitioned employees and operations to the new headquarters. Faurecia’s products need to meet both automotive OEM noise and vibration standards, or preference rating specifications, and its own established consumer tolerance thresholds. During production of new vehicles, automotive manufacturers rely on Faurecia to test their seat frames and motor controls to achieve specific noise and vibration goals. 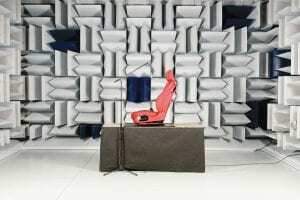 Accordingly, Faurecia required the new hemi-anechoic test chamber to meet the ISO 3745 standard for transmissibility, including a target base ambient sound level below 25 dBA (somewhere between rustling leaves and a whisper). The Eckel chamber exceeds the ISO specifications: It’s certified at 17 dBA. Internally, the chamber measures 19 feet, 4 inches by 28 feet, 10 inches and 12 feet, 2 inches high. It features a 10-foot by 10-foot vehicle door, a 7-foot by 3-foot personnel door and an isolated floor that prevents external vibrations from being transmitted into the chamber. The walls, ceiling and doors are covered with anechoic perforated metal wedges, each measuring 34 inches long. The chamber has a 100 Hertz cutoff frequency (the cutoff is the frequency at which the energy absorption drops below 99%, or the pressure reflection exceeds 10%). It also incorporates a 2,000 CFM silenced ventilation system. In order to meet Faurecia’s request for a distinguishing element—something that would make the chamber immediately recognizable as Faurecia’s—Eckel painted select anechoic wedges blue. With expertise in creating optimal sound environments, Eckel Industries has been at the forefront of acoustic analysis and design for more than 60 years. Headquartered in Cambridge, MA, Eckel helped to create the world’s first Anechoic Chamber at Harvard University. Since then, the company has pioneered chamber design for use in product testing—from cell phones to cars to jet engines—helping engineers and manufacturers achieve exceptional quality standards. Building on the science behind its chambers, Eckel’s Audiometric Rooms create the ideal controlled environment for hearing testing and other sound isolation applications; while its Acoustic Panel Systems provide precise control of reverberation and background noise in any setting—from auditoriums and gyms to concert halls and industrial facilities. No matter the acoustic challenge, Eckel has a sound solution. Learn more at www.eckelusa.com. Spell out any special loading requirements for the interior chamber floor. © 1952-2019 Eckel Industries Inc. All Rights Reserved.